Wrap your favorite ingredients into a burrito and go! A hard-boiled egg is an easy way to add protein to your on-the-go breakfast. No panini press? No problem, just grill sandwiches in a skillet over medium heat. HEAT panini press according to manufacturer's directions. 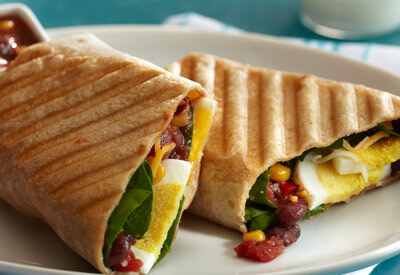 PLACE 1/2 of the eggs in middle of each tortilla; top evenly with spinach, salsa and cheese. FOLD sides of tortillas over filling; fold up bottom edge and roll up. GRILL burritos in panini press, on medium-high heat, until tortillas are toasted and filling is heated through, about 3 minutes. No panini press? Burritos can be grilled in a skillet over medium heat, turning once, until tortillas are toasted and filling is heated through, 2 to 4 minutes. To hard-cook eggs: PLACE eggs in saucepan large enough to hold them in single layer. ADD cold water to cover eggs by 1 inch. HEAT over high heat just to boiling. REMOVE from burner. COVER pan. LET EGGS STAND in hot water about 15 minutes for large eggs (12 minutes for medium eggs; 18 minutes for extra large) COOL completely under cold running water and peel. To peel a hard-boiled egg: Gently tap egg on countertop until shell is finely crackled all over. Roll egg between hands to loosen shell. Starting peeling at large end, holding egg under cold running water to help ease the shell off. Storage time: In the shell, hard-boiled eggs can be refrigerated safely up to one week. Refrigerate in their original carton to prevent odor absorption. Once peeled, eggs should be eaten that day.